As competition starts to bite, the pace of fibre-to-the-home (FTTH) deployment in Europe is accelerating, according to the latest figures presented at the FTTH Conference 2015 in Warsaw. This year, the FTTH Council Europe reported 60 per cent growth in the number of FTTH/B subscribers in the European Union member states over the year ending December 2014. The total number of FTTH/B subscribers in Europe - from Iceland in the west to Turkey in the east - has now reached nearly 15 million (14.8 million to be exact); 12.3 million of them in the EU. If you include Russia and the Commonwealth of Independent States, the number of FTTH/B subscribers jumps to 30.2 million. Russia remains the heavyweight in the region with 13.4 million customers on full fibre connections. 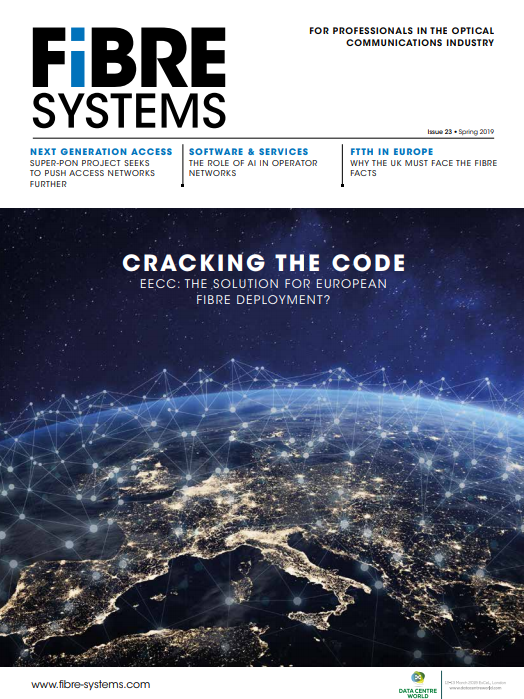 “We are today in the ramp-up phase of subscriber adoption in Europe and the incumbents are playing a key role,” said Roland Montagne, head of telecoms business unit at Idate, which collects and analyses the data on behalf of the FTTH Council Europe. It’s worth noting that incumbents led the FTTH roll-outs in both Lithuania and Latvia, which already enjoy 100 per cent coverage with FTTH/B. 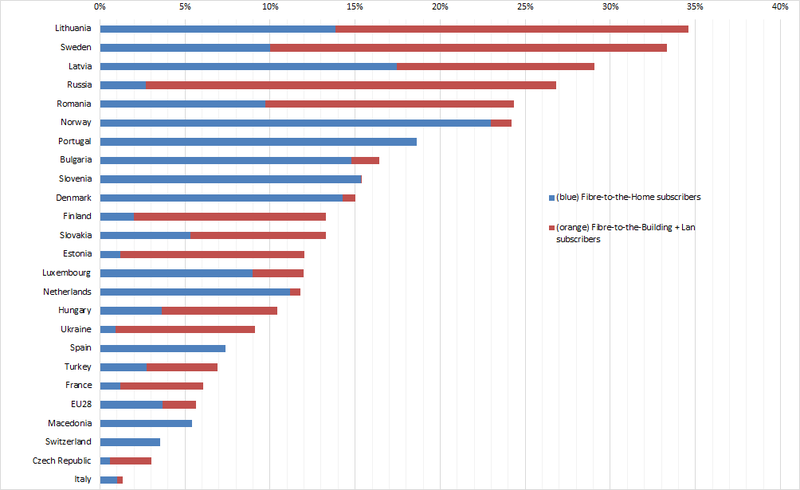 Lithuania currently leads the FTTH ranking with nearly 35 per cent subscriber penetration, having overtaken Sweden, while Latvia lies in third place. Over the past year, incumbents have increased their overall market share of homes passed by 2.2 per cent to reach 27.7 per cent - even though they are vastly outnumbered by alternative operators, utility companies and municipal projects. In this second wave of incumbent deployments, it’s often those competitive players that spur the incumbents to act. In France, Portugal, Spain, Sweden and Turkey it was the alternative operators that made the first move towards fibre. “Incumbents are very powerful players. If they commit, then they can move very quickly,” noted Graham Finnie, senior analyst with market research firm Heavy Reading, who uses Idate's data as the basis of a market forecast for the FTTH Council Europe. He points to Spain, where Telefónica passed more than 6 million homes with FTTH over the course of last year. As a result, Telefónica has become the first operator in Europe to have more FTTH lines than Verizon - even before Verizon’s decision to sell some of its territories to Frontier. Romania is another case in point. Last in the ranking a year ago, the country has leapt up into fifth place and nearly 25 per cent of Romanian homes now have FTTH subscriptions. In 2014 Telekom Romania rolled out gigabit broadband via FTTH to 13 major cities across the country. Other incumbents to make significant progress in the past year, according to Idate’s data, were Orange France, which passed an additional 897,000 homes in 2014; TeliaSonera in Sweden with another 416,000 homes passed; Reggefiber in the Netherlands with 312,000 homes passed; while Turk Telekom in Turkey covered 300,000 more. Heavy Reading predicts that the number of FTTH/B connections in wider Europe, including Russia, will double over the next five years to reach almost 62 million by 2019, out of 324 million households in the 44 countries included in the study. Of those 62 million, Finnie expects almost half (47 per cent) will be delivered by incumbent national operators. By 2019 France is expected to become the second largest market for FTTH after Russia, as incumbent Orange plans to cover 15 million households by 2020. In absolute terms, Germany will also become an important FTTH market, with both incumbent and alternative operators contributing to the total number of homes connected. However, the UK continues to languish at the bottom of the league tables, with just 43,000 FTTH/B subscribers out of 380,000 homes passed at the end of 2014, according to the research by iDATE. The two leading players in superfast broadband - BT and Virgin Media - have bet on other technical approaches (see BT puts G.fast at the heart of its broadband strategy). The gap between the best and the worst performers will continue to increase, according to Heavy Reading’s Finnie. By 2019 five of the 22 countries studied in detail – including Italy and the UK - will still have less than five per cent FTTH adoption, he says.